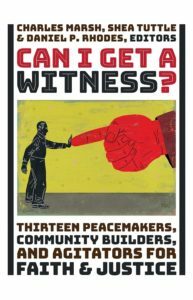 The two-part SILT celebrated scholars, activists, laypeople, and religious leaders whose lived theologies produced and inspired social justice in the United States, and will produce a single volume entitled Can I Get a Witness? which will be published by Eerdmans and released in early 2019. The first meeting, in June 2016, gathered the biographers at the University of Virginia. The writers attended seminars on theology and biography, discussed writing style and process, and met in workshop groups that supported each other throughout the writing process. Click the meeting link for further details and photos from the gathering. The second meeting, in June 2017, gathered the biographers and editors at Loyola University Chicago for editorial conversations, workshops on essays-in-progress, and a public reception to begin introducing our forthcoming book to a broad audience. Click the meeting link for further details and photos from the gathering.